China impresses me every time I visit. The skyline is dotted with new skyscrapers that didn’t exist a year ago, gorgeous, modern, sleek bridges that belong on the cover on an engineering magazine are everywhere, new freeways have seemingly popped out of nowhere, and the hustle and bustle of construction dominates your senses. China is growing. Like crazy! Buried in that growth are some amazing accomplishments, and China hit a handful of impressive milestones last week. All of them are spectacular in their own rights, but they also have some important investment implications. Chinese Milestone No. 1: WORLD SPEED RECORD FOR TRAINS. China inaugurated a super-fast rail line from Shanghai to the resort city of Hangzhou. 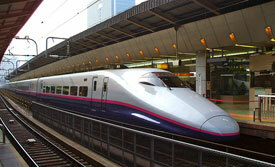 The train will cruise at a top speed of 220 mph, a world speed record. This train can make the 125-mile trip in 45 minutes. China’s high-speed rail network now stretches over 7,431 km. The government plans to expand the network to over 16,000 km by 2020. The high-speed rail network is built mostly on viaducts for grade separation, level running, and to minimize the amount of ground space needed for building. Unlike most railroads in the United States, the Chinese system does not share the rails with slower freight traffic. China plans to expand its high-speed rail network to over 16,000 km by 2020. Furthermore, China is committed to doubling the size of its railway network from 7,000 kilometers to 16,000 kilometers by 2020 at a cost of $300 billion. Somebody is going to make a mountain of money from it. Investment Opportunity: There are several Chinese railroad and railroad construction companies that are cleaning up from the massive build out of China’s railroad network. Guangshen Railways (NYSE:GSH), China Railway Construction (CWYCF.PK), and China Railway Group (CRWOF.PK) are big beneficiaries from that growth. Chinese Milestone No. 2: WORLD SPEED RECORD FOR COMPUTERS. America invented computers after all, and American computer companies — like IBM, Dell, Intel, and Cray — have dominated the technological side of the computer industry for decades. That dominance has disappeared. A Chinese scientific research center set a new performance record for supercomputer processing speed. Built by the National University of Defense Technology, this new supercomputer set the world record for speed. This Chinese supercomputer uses 7,168 NVIDIA graphics chips and 14,336 Intel processing chips giving it enough power to process 2,507 trillion floating point calculations per second. That is 30% faster than the previous record holder, the Oak Ridge National Laboratory in Tennessee. How much did this super computer cost? How’s $88 million sound? When it comes to computers, U.S. companies are losing market share fast. Acer Computer, by the way, recently passed Dell as the No. 2 computer company in the world. Investment Opportunity: China and Taiwan are quickly becoming the crème of the computer crop. Companies like Lenovo (LNVGY.PK), Acer (ACEIF.PK), Hon Hai Precision Industries (HNHPF.PK), and China Information Technology (Nasdaq: CNIT) are some of the most promising hardware and software companies in Asia. If you’re more of an ETF investor, take a look at the Guggenheim China Technology ETF (CQQQ). Chinese Milestone No. 3: WORLD’S LARGEST ELECTRICITY SOURCE. Everybody has heard of the Three Gorges Dam project, and although it opened in 2008, the reservoir just reached full capacity. The water level in China’s Three Gorges Dam reached ‘full pond’ at 574 feet for the first time since it began generating power in 2008. This $22 billion dollar project is now running 26 generators with a capacity of 84.7 billion kilowatt-hours of electricity annually, the most of any dam in the world. By 2012, another six generators are expected to go into operation and push that number even higher. China has a lot more infrastructure projects under way or about to start, such as the $32.5 billion, 820-mile Beijing-to-Shanghai high-speed railway to be completed in 2012, more nuclear power plants, and a project to pump river water from the fertile wet south to the desperately arid north. Investment Opportunity: China is going to be building bridges, shipping ports, railroads, power plants, airports, highways, and water plants for decades. Some of the biggest constructions winners will be ABB Ltd (NYSE:ABB), China Communications Construction (Hong Kong: 1800.HK), Anhui Conch Cement (AHCHY.PK) and General Steel (NYSE:GSI) are sitting pretty. ETF investors should look at the EGS China Infrastructure ETF (CHXX). By the way, there is an India Infrastructure ETF (INXX). India is one of the world’s fastest growing countries, but unlike China, its infrastructure is WOEFULLY inadequate and painfully dilapidated. About 23% of the fund is invested in electricity firms, 19% in construction and materials, 14% in industrial metals/mining, and the rest is made up of industrial engineering, telecom, oil and gas, electrical equipment, and even alternative energy. Chinese Milestone No. 4: WORLD RECORD FOR BILLIONAIRES. All those technological achievements are impressive, but from an investor’s perspective, the most important milestone is creating wealth. According to Forbes, China has produced 49 more billionaires in the past year, bringing the total to a record 128 from 79. Of the 128 tycoons with a 10-figure net worth, nine are under the age of 40, and 11 are women. Shenzhen, the manufacturing Mecca of China, leads with 17 billionaires, followed by Beijing with 15 and Shanghai with 10. 10% of the 400 richest Chinese in Forbes Asia‘s latest overall ranking get all or part of their fortunes from China’s health care sector. Investment Opportunity: There are several Chinese health care-related companies that are listed on a U.S. exchange. Investors should take a look at companies like Sinovac (NYSE:SVA), WuXi Pharma Tech (NYSE:WX), American Oriental Bioengineering (AOB), 3SBio (Nasdaq:SSRX), China Medical Technologies (NYSE:CMED) and Mindray Medical (NYSE:MR). Bet you didn’t know that many Chinese health care stocks were listed in the United States, did you? And if you just wanted to jump on the same gravy train as all those Chinese billionaires, the easiest way is to buy a broadly diversified Chinese ETF like the iShares FTSE/Xinhua China 25 ETF (FXI).